A woman is devastated, after her son stabbed her brother, who died at the Karl Heusner Memorial Hospital at about 9:00 Saturday morning. Alice Ferguson’s son, Oliver Peters, 36, will be arraigned on a charge of murder for the death of her brother, Thomas Eugene Ferguson, 53, who died on Saturday, February 24, two and a half months after he was stabbed by his nephew at about 1: 00 Friday morning, December, 6, 2013, at their family house on Arlington Drive. Ferguson told Amandala that they were all at home sleeping that Friday morning, when Peters, who does not live with them, came to their house and began to cause an uproar. He caused the light in the house to go out by breaking the bulb and got into an altercation with his brother and then punched his brother in the face. Peters then got a knife and went to the home of his uncle, Thomas Ferguson, which was in the same yard. He knocked on the door and when Ferguson opened the door, he stabbed his uncle in the chest. Ferguson then fell to the floor. Alice said that her son stood there, watching his uncle on the floor. She said she got angry with him and asked him why he stabbed his uncle. Ferguson was taken to the Karl Heusner Memorial Hospital, where he was declared to be in a critical condition. He was then taken to the intensive care unit, where he has since been fighting for his life until Saturday, February 22, when he died due to complications of the wound to his chest. Police who responded to reports of the incident that morning found Peters with the knife in the next yard, trying to escape. Oliver Peters was charged with attempted murder, use of deadly means of harm and dangerous harm, and was remanded to the Belize Central Prison, and, since the death of his uncle, the charge will be upgraded to murder. His devastated mother said that there had been an ongoing dispute between her brother and her son over the land on which they live on Arlington Drive. The land belonged to her brother, but was being claimed by her son. She said that the situation has been taking its toll on her, and she has been very worried, as well as angry with her son. The other members of the family are also angry with Peters, because Ferguson died leaving behind eight children, the youngest being 6 years old. They are calling for a life sentence for him. The family said that since Ferguson was hospitalized, the hospital bill had mounted to over $30,000, and his wife is not employed, and it will be difficult to pay that huge sum of money. The family was given $1,500 by the Social Security Board, but it is not sufficient to bury him. They showed Amandala an invoice from the undertaker which indicates that $2,451 more is needed to cover the burial expenses. They are calling on the Government to help them by clearing off the huge hospital bill, and also they seek public support through monetary donations to pay the undertaker to bury their loved one. They can be contacted at their home at 7173 Arlington Drive, or at phone number 634 -7413. 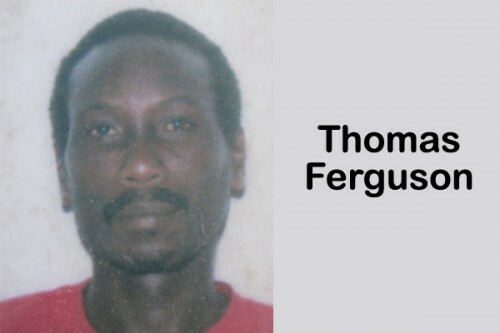 Thomas Eugene Peters was a former Belize Defence Force soldier.